Welcome to our ongoing life project! There is a tradition in Japan to understand everything is ever changing and growing. Every aspect of Japanese society is rebuilt and renovated on a daily basis, from temples to hair color the change never ends. Their attention to food is no different. Their recipes continue to develop through countless generations, and every meal is a new and exciting experience. This culinary tradition is 49% of the Miso Hungry Story, the other 51% is that of Momo and I’s experience traveling around the world, a love for cooking good food, and a passion for mobility and freedom. Momo and I met almost 8 years ago whitewater raft guiding in Japan. From day one we lived together in a stinky raft guide sardine-can accommodation, and hardly spoke until the language barrier began to fall two months into the season. From then on it was evident, beyond all doubt, Momo and I were two halves of the same wild and spontaneous whole. We shared a love for good food, better cooking, skiing and snowboarding, travel, dancing, and wanting to work for ourselves. We spent three winters in Japan, a summer in Boulder, CO, three months in NY, a ski and surf year in Australia, and several one week visa runs throughout Southeast Asia. In 2012, when living in Mt Buller, a ski area in the Australian Alps, Momo and I began to ponder a way to continue what we love and the idea of working for ourselves. We drew on our experiences traveling, of working in hospitality since high school, my experience working and managing restaurants, Momo’s specialty in Japanese cuisine, and our love for skiing and snowboarding. 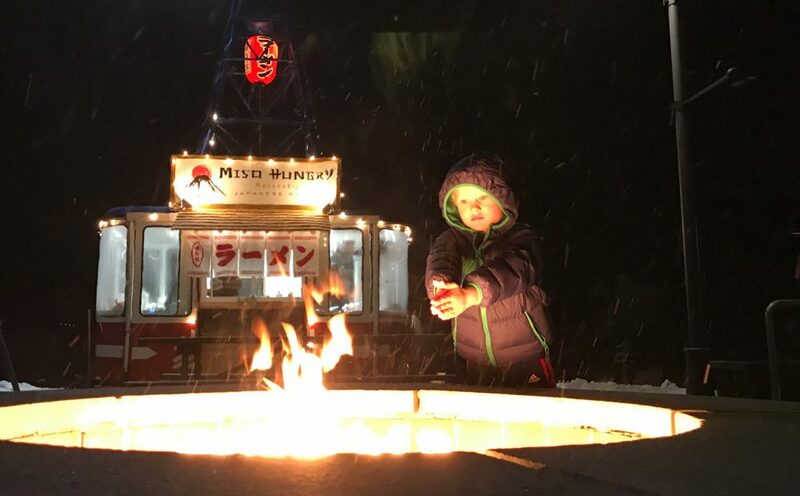 In Japan we witnessed food trucks succeed in busy ski resorts and wondered why, elsewhere, winter food trucks did not exist. We both agreed then, if we ever had the money to start our own truck selling our favorite Japanese food, Ramen, we would go for it. Unfortunately, we never had the money. 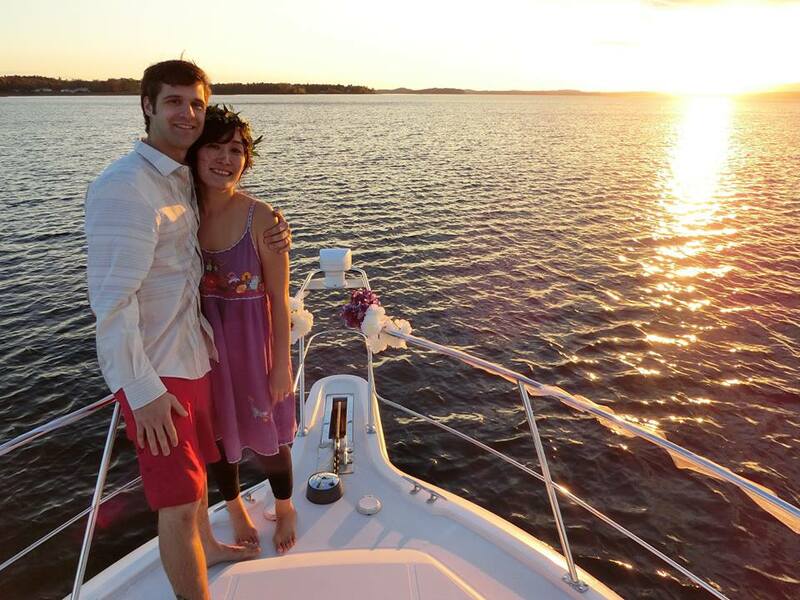 We spent every penny we had on plane tickets and starting a new life every three-six months. Then came summer 2014. I was offered a job to re-invent a restaurant in my hometown on a small golf course. I took the job and Momo stayed in Japan for two months to study Ramen and make money. It was a long two months, but it allowed me time to rebuild the restaurant with an amazing chef and friend, Evan Luey. In those two months Chef Luey and I did well enough to pay for an engagement ring and longboard for Momo, and when she arrived I asked her to marry me in the airport. She said yes. 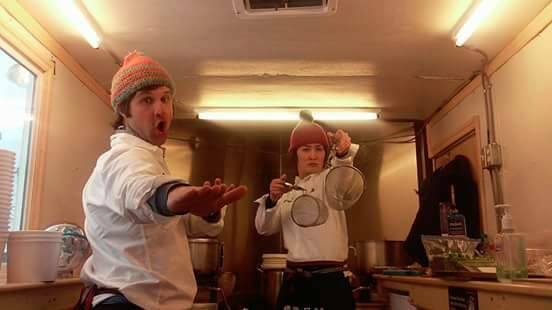 The plan was always to run the restaurant for the summer, then Momo and I would leave for New Zealand for a year. But when the restaurant did well with Chef Luey, Momo and I working 70+ hour weeks but making good money, we brought up the idea to start the Ramen Shop then and there. When we finally agreed to go for it, we were married 36 hours later and bought a hollow cargo trailer for $3,000. Seven busy and exciting weeks later we opened Miso Hungry – Authentic Japanese Ramen near Jay Peak Ski Resort. We had an absolute blast all season meeting some amazing people and have slowly came to the conclusion, for the first time in four years, we weren’t going to pack our bags and move away in the spring. course for our dog Miso. the heavens has helped us begin our life in Jay, VT where we now own a home, and have renovated an old tram car on Jay Peak Resort Premise for winter operations. We are extremely fortunate to find ourselves where we have landed still noodling, still loving, and still making new friends everyday. Thank you for finding us and reading our story. We look foreward to repectfully noodling you in the very near future! I love this story and am so happy for the two of you. I hope to try some of your famous ramen truck food very soon!! Sushi in Gloversville, but So Happy For you guys nonetheless! Your story is so great! Much happiness and success to you both! So happy and excited for you both. Love your story and the both of you so much. I admire your passion and envy your adventures. So awesome to see what you say in this story really reflected in life, Momo is the half to your whole and it is undeniable. So glad I was able to witness it for myself. Grateful I was able to see you guys during your time at the Golf Course and hope to experience Miso Hungry for myself sooner rather than later. My boyfriend and I had your ramen at the Decemberists concert on July 30th. We are in love. So happy to have delicious ramen in VT!! Hope to see you in Montpelier soon! We would bring a crowd! Just up with my family this past week, and loved the ramen. I love your story, and “cutting your own teeth” running your own place is the way to do it. I am 27 years into snowboard/skateboard shop myself and dropped out of college and opened it up when I was 19. THE BEST WAY TO LEARN IS HAVING YOUR OWN SKIN IN THE GAME. I love your story. It’s very inspirational! Miso Happy to try Miso Hungry Ramen this weekend!!! Looking forward to meeting you two if you are there! Greetings from Saratoga Springs. Do you guys sell your shirts and were you at Wanderlust in Stratton last summer? Great story Nooch(‘s)! how do you keep your chest so bare? !